Just as the recent monetary data from the Eurozone has revealed the parlous state of demand there, the money supply data released by the Bank of England yesterday revealed a collapsing borrowing by households and firms in Britain scale not previously seen. It is clear that the December data shows that households are deleveraging (paying credit cards down) and business firms are now in full retreat similar to the worst of the recent downturn in 2009. The evidence for that conclusion is to be found in the fact that the Bank of England’s broad money supply measure contracted by 1.4 per cent in December, which the Bank noted was the largest single month contraction on record (shared with December 2010). Just like the latest ECB monetary aggregates are showing what the real situation is like in the Eurozone, the Bank of England’s data is painting a very grim picture of life in Britain as the draconian fiscal austerity drives that economy into the ground. The data also provides a continued rejection of mainstream macroeconomic theory, which is an interesting aspect in its own right. The Bank of England data also shows that consumer credit (everything except housing mortgages) fell by £377 million in December 2011 (to a level of £207 billion) which is the largest monthly decrease since the data was first compiled in 1993. The other point to note is that it is the first time on record that households have actually paid off debts in a December month. The Christmas spending surge typically sees the opposite. Further, business firms also reduced their borrowing in December 2011. The consistent trend is now for less private spending growth, which is exactly the opposite to what the British government, under the influence of mainstream macroeconomic thinking, claimed would happen. The British people were told that if the government cut its deficit then their tax burdens would be lower and that they would be able to spend more freely as a consequence. All this is the Ricardian equivalence nonsense. Please read my blog – The impossible equation – for more discussion on this point in relation to the UK. The reality is that households will not expand spending while unemployment is high and rising and business firms will not increase investment while the outlook is so bleak and they can meet all the current demand for goods and services with the existing capital stock. Modern Monetary Theory (MMT) predicted the fiscal austerity plans would push the British economy towards a double-dip recession as private consumers and firms cut back on their own spending driven strongly by the fear of unemployment and flat sales conditions that accompany that situation. MMT also predicted that an export-led growth strategy in a international environment of declining growth driven by similar fiscal austerity programs elsewhere would fail. Please read my blogs – Deficits should be cut in a recession. Not! and Fiscal austerity – the newest fallacy of composition – for more discussion on this point. M4 is the broad monetary aggregate used by the Bank of England to depict the money supply. The Bank of England provides comprehensive Explanatory Notes – M4 to help interested readers. debt securities up to 2 years. So there is some difference between the two series but both indicate broad monetary stocks in the economy and are used to denote the “money supply”. The following graph shows the monthly growth (per cent) in the M4 broad monetary aggregate since August 1982 (end of month estimate). The data is seasonally adjusted. The data is available from the Bank of England – Table A Money and lending. The result for December 2011 (-1.4 per cent) was matched in December 2010 but together they are the lowest growth figures recorded in the history of this series. The following graph shows the annualised growth (per cent) in the M4 broad monetary aggregate since July 1983 (end of month estimate). The data is seasonally adjusted. The smoother annualised series shows the cyclical nature of the movements in money supply growth and the stark collapse in last few years despite quantitative easing. The prospects of fresh action by the Bank of England to boost growth increased on Tuesday after Threadneedle Street released figures showing a contraction in the money supply and weak borrowing by both companies and households. News of a drying up of credit left City analysts confident that a fresh round of quantitative easing would be announced by the Bank’s nine-strong monetary policy committee when it meets next week. Larry Elliot quotes a UK financial “analyst” as saying that “(t)he continued weakness of broad money and lending growth bolsters the case for the MPC to announce another round of quantitative easing at February’s meeting”. There are similar quotes provided from other “analysts”. I wondered what they were thinking. Why any analyst would think the quantitative easing under these circumstances would be indicated is beyond me. What it tells me is that they have a limited understanding of the links between the monetary operations of the central bank, the behaviour of the commercial banks, and the macro economy. You can’t really make any sense of the realities of monetary operations if you don’t understand these linkages. Please read my blog – Quantitative easing 101 – for a detailed discussion of this policy program. The Bank of England has their own WWW page – Quantitative Easing Explained – which purports to outline “How it works”. Bank Rate could not practically be reduced below that level, and in order to give a further monetary stimulus to the economy, it decided to undertake a series of asset purchases. So the aim of QE in the Bank’s mind was to “inject money directly into the economy in order to boost nominal demand”. Nominal demand is what macroeconomists call aggregate demand and is just the sum of the aggregate spending components – consumption, investment, government, net exports. The Bank claims that its aim was not to stimulate demand per se but rather to meet its “inflation target of 2 per cent” and they hypothesised that without “that extra spending in the economy … inflation would be more likely in the medium term to undershoot the target”. That is a central bank way of saying that there would be a serious recession which would severely damage economic activity and invoke a harsh deflationary spiral. Rather, the policy is designed to circumvent the banking system. The Bank of England electronically creates new money and uses it to purchase gilts from private investors such as pension funds and insurance companies. These investors typically do not want to hold on to this money, because it yields a low return. So they tend to use it to purchase other assets, such as corporate bonds and shares. That lowers longer-term borrowing costs and encourages the issuance of new equities and bonds. This makes it clear that QE does not aim to provide more cash to banks in order to increase lending. The Bank of England knows full well that bank lending is being constrained by a lack of credit-worthy borrowers and that loans are not constrained by available reserves. Loans create deposits and any reserves that might be required to ensure the payments system remains integral are added (in a variety of ways) later. You can read more about the Bank of England’s QE policy in an article in the third-quarter 2011 edition of their Quarterly Bulletin – The United Kingdom’s quantitative easing policy: design, operation and impact. The mainstream belief is that quantitative easing will stimulate the economy sufficiently to put a brake on the downward spiral of lost production and the increasing unemployment. It is based on the erroneous belief that the banks need reserves before they can lend and that quantitative easing provides those reserves. That is a major misrepresentation of the way the banking system actually operates. But the mainstream position asserts (wrongly) that banks only lend if they have prior reserves. The major formal constraints on bank lending (other than a stream of credit worthy customers) are expressed in the capital adequacy requirements set by the Bank of International Settlements (BIS) and administered by each national prudential regulator. They relate to asset quality and required capital that the banks must hold. These requirements manifest in the lending rates that the banks charge customers. Bank lending is never constrained by lack of reserves. As explained by the brief Bank of England quotation, quantitative easing involves them buying one type of financial asset (private holdings of bonds, company paper) and exchanging it for another (reserve balances at the BOE). The net financial assets in the private sector are in fact unchanged although the portfolio composition of those assets is altered (maturity substitution) which changes yields and returns. How these opposing effects balance out is unclear. The central banks certainly don’t know! Overall, this uncertainty points to the problems involved in using monetary policy to stimulate (or contract) the economy. It is a blunt policy instrument with ambiguous impacts. The money supply data tells us that there is an unwillingness to spend by the private sector and the resulting spending gap, has to, initially, be filled by the government using its fiscal policy capacity. Quantitative easing is not a sensible anti-recession strategy. The fact that governments are using it now just reflects the neo-liberal bias towards monetary policy over fiscal policy. What will motivate consumers to borrow if they are scared of losing their jobs? Why would a company borrow if they expect their sales to be depressed? The problem is a failure of demand which has to be addressed via demand measures – that is, fiscal policy. There are also those that claim that quantitative easing will expose the economy to uncontrollable inflation. This is just harking back to the old and flawed Monetarist doctrine based on the so-called Quantity Theory of Money. This theory has no application in a modern monetary economy and proponents of it have to explain why economies with huge excess capacity to produce (idle capital and high proportions of unused labour) cannot expand production when the orders for goods and services increase. Should quantitative easing actually stimulate spending (via increased demand for credit) then the depressed economies will likely respond by increasing output not prices. What about the relation between the monetary base and broad money (M4)? There was an excellent article in the Bank of England’s Quarterly Bulletin describing how the monetary base is calculated – Bank of England (1981), ‘The monetary base — a statistical note’, Bank of England Quarterly Bulletin, March, pages 59–65. It is not available in electronic form as far as I know but if you have access to a library then it is worth reading should you be interested in these matters. In the Autumn 2005 edition of the Quarterly Bulletin there was an interesting article – Publication of narrow money data: the implications of money market reform – which discusses the monetary base. The article says that narrow money (M0) had previously been described as the (wide) monetary base and comprised: notes and coins in circulation plus bank’s vault cash plus bankers’ deposits with the central bank. The article claims that the “(b)ankers’ operational balances have constituted a tiny component of M0” – which was the case in 2005 – just 1.3 per cent in August 2005. The article does provide some interesting history of economic thought and demonstrates the influence that mainstream macroeconomics has had on monetary policy practice. In the second half of the 1970s, UK counterinflationary policy came to place greater weight on measures of aggregate money than before, evidenced by the publication of annual intermediate targets for broad money growth. The Conservative government elected in 1979 initially maintained targets for broad money growth, but, influenced by academic economists, it also considered monetary base control as an alternative technique to achieve its medium-term objective to reduce inflation. 1. That there is a money multiplier which says that the money supply is a causal multiple of the monetary base. 2. That the central bank can control the money supply because it can control the monetary base. 3. That such control reduces inflation risk, because inflation occurs when the money supply grows. I have written several blogs outlining why this causal chain of thinking is an incorrect depiction of the way central banking works and the influence of its operational decisions on the money supply and inflation. Yesterday’s blog – Latest ECB data shows how bad things have become in Euroland – is a good place to start. I covered the base money-money supply relationship in these blogs among several – Money multiplier – missing feared dead and Money multiplier and other myths. Further, the following blogs – Building bank reserves will not expand credit and Building bank reserves is not inflationary – provided relevant analysis. where C is notes and coin in circulation with the public (ie the non-bank private sector) and R denotes banks’ reserves (the total of banks’ till money and bankers’ operational deposits at the Bank of England). Historically, the banks’ reserve ratio, r, had been steady, reflecting the UK policy of supplying additional reserves to the banking system on demand at an interest rate chosen by the authorities. However, monetary base control would imply that banks would be refused access at any price to reserves beyond those that the Bank of England planned to supply. That could lead to greater volatility in banks’ desired reserve ratios and much greater volatility in short-term interest rates, which would then be determined by the market rather than monetary policy makers. Monetary base control was therefore rejected as policymakers were uncertain as to the amount of reserves that banks would wish to hold under such a system. 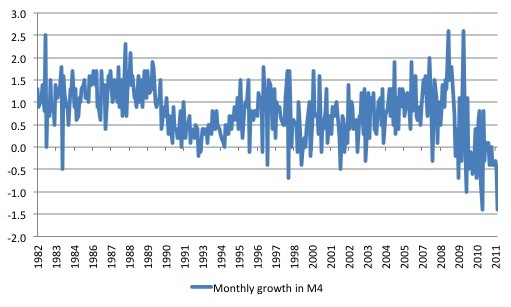 In fact, the multiplier linking the broad money stock (M4) to M0 has proved to be anything but stable. M4 is a broader measure of the money supply than M3, but that is not the issue here. This is a very powerful statement but one that you will not find in mainstream macroeconomics textbooks. It says that banks prefer to hold some desired reserves with the central bank to ensure that all the claims on them each day are able to be met. That is, to facilitate the integrity and stability of the payments system. But ultimately the banks know that if they are short of reserves on any particular day they can call on the central bank to supply the additional reserves to keep the payments system liquid and prevent financial instability (where cheques bounce and panic sets in). Should the central bank refuse to provide those reserves (because it wants to “control” the money base), the banks would then have to maintain much larger buffers which would make the overnight money market (the interbank market) very liquid indeed. The impact of that “excess liquidity” would be that banks would be trying to get a competitive return on their excess reserves by lending to each other and effectively the excess would drive the overnight interest rate down. As noted in the quote – “short-term interest rates … would then be determined by the market rather than monetary policy makers”. That is, the central bank would lose control of its monetary policy tool – the setting of short-term interest rates. Finally, note that there has not been a stable relationship between broad money and base money which undermines the credibility of the money multiplier notion. Modern Monetary Theory (MMT) explains that there is no stable relationship because the money supply (M3 or M4) is not causally driven by the monetary base as is asserted by mainstream macroeconomic theory. Instead, while the base responds to movements in the broader aggregate because the central bank will always provide reserves to banks on demand, the reverse is not the case. As explained in yesterday’s blog, movements in the broader aggregate are endogenously driven by the state of the economy – in particular, the demand for credit by households and firms. When the economy is faltering, as it is now in Britain (an understatement) then we would expect the growth in the broader aggregates to decline which is just what we are observing. 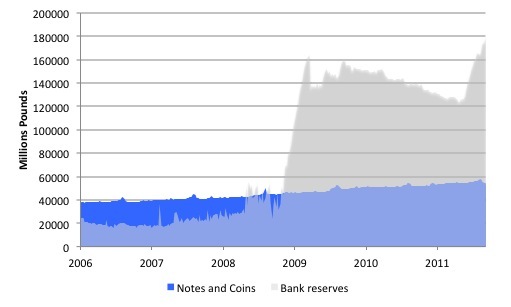 The following graph shows the evolution of the Bank of England’s narrow money measure (currency in circulation plus bank reserves) since May 24, 2006 to January 25, 2012 (this is weekly data). The data is available from the Bank of England – Table B Monetary financial institutions’ balance sheets, income and expenditure. The two series are Notes in circulation – RPWB55A and Reserve Balances – RPWB56A. You can see that the earlier assessment the bank reserves were small part of the narrow money measure has been overtaken by events. The rapid rise in bank reserves as a result of the Bank of England asset purchase program (qualitative easing) is clearly evident. With both the broad money supply measures and the overall rate of inflation falling at the same time as the monetary base has expanded so much you might be excused for questioning the veracity of mainstream monetary theory. 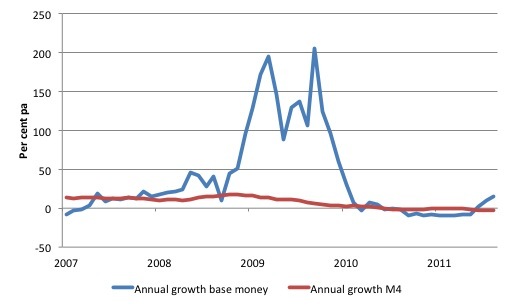 Just for completeness following graph shows the annual growth in base money in the UK (blue line) compare to the annual growth in broad money (M4). The Bank of England’s assets purchase program saw a staggering growth in the monetary base (driven by the rise in bank reserves) at a time when the broad monetary aggregate was in decline. Given the current conditions in the real economy (moving into recession), even if the Bank of England engaged in a new round of quantitative easing, I would expect the growth in the broad monetary aggregate to continue to be subdued, if not negative. Broad money growth will only become robust again when the economy resumes more sustained growth. That will not occur while the British government is undermining aggregate demand by its fiscal austerity program. British households and firms will not resume their demand for credit in any substantial way while unemployment is rising and economic activity is stagnating, if not recessing. Just like the latest ECB monetary aggregates are showing what the real situation is like in the Eurozone, the Bank of England’s data is painting a very grim picture of life in Britain as the draconian fiscal austerity drives that economy into the ground. The data also provides a continued rejection of mainstream macroeconomic theory, which is an interesting aspect in its own right. Over the last several years, the major predictions that one would derive from mainstream macroeconomic theory have been discredited by the actual data. The state of orthodox monetary theory is in ruins and students would be well advised not to take courses in “Monetary Economics” or “Macroeconomic Economics”. I have to finish there – a plane to catch. What I find weird is that the UK Govt is now holding over 25 per cent of the National Debt and is effectively paying itself interest through a company set specially by the bank of England and no-one (apart from Neil) questions what’s going on. There is clearly no chance of unwinding these asset purchases as the money supply figures show but the only realistic alternative to maintaining this mad policy of holding its own debt and paying itself the interest forever is to write off the debt and that would mean political suicide because their whole rationale for austerity is that the debt needs to be controlled by deficit reduction. Long term government bonds benefit from policy failure. So by buying them the central banks are placing bets against economic growth. If the economy recovers, the central bank loses money and perhaps becomes technically insolvent. Since that is not a desirable outcome for a central bank, one can interpret QE as a commitment to not allow the economy to recover. Your first two charts actually UNDERESTIMATE the absurdity of the situation in that they do not take inflation into account, do they? I.e. 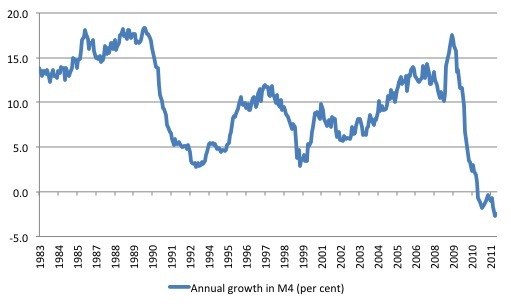 to get the REAL change in M4, don’t the blue lines need to be shifted downwards 4-5%? I suggest that central banks cannot become insolvent in that they have an inexhaustible source of money: the printing press. Of course it’s possible that a CB makes a loss when reversing QE, and it’s possible that the money printed to do this has too much of an inflationary effect. But that is easily dealt with by raising interest rates, or raising taxes. Anybody wondering why base money was negative for a year need only understand that in the UK we pay interest on the Gilts held by the Central Bank but that interest is then hoarded by the Central Bank rather than being returned to the Treasury. It’s an odd design that the Bank of England refuses to tell me anything about – citing the ‘monetary policy’ exemption in the Freedom of Information Act. I thought spending by the government on interest fell under fiscal policy, but what do I know. The effect is that the Central Bank QE’s some Gilts to increase Bank Reserves, and then the Treasury issues slightly more Gilts than it strictly needs to which has the effect of draining those Bank Reserves. In other words the left hand is undoing what the right hand has put in place. Regrettably the dip in Bank Reserves in the above graph is not due to extra taxation thanks to increased economic activity. It’s due to government stupidity. From your article and the initial comments it appears that the eventual unwinding of QE if UK ever achieves demand growth will then strangle it either with increased taxation or higher interest rates- talk about painting yourself into a perpetual corner! Clever chaps those Central Bankers – never mind in the UK the treasury ensured their pensions are inflation proof (hence the missed inflation targets of 2% when reality is 5+%!!). Would you mind please changing the heading on your blog from “alternative economic thinking” to “updated economic thinking”. The word “alternative” often carries a coonotation of “off the wall” or “a second or another correct choice”. How about Actual Economic Thinking. I see someone mischieviously called MR, MMR in a post on another site. He might have been a Brit. Well anyway MMR now seems to have been adopted. Dont tell yet please. Joe, Andy, I had a similar reaction to the blog subtitle. Alternative to what? It presumes that there is something in modern economic orthodoxy which deserves the words “economic” or “thinking”. Updated? – MMT has deep & ancient roots. Non-bank sellers of UK Gilts to BoE would have excess cash balances. Unless money was considered a perfect substitute for gilts then other assets which were considered better substitutes would be bought. This, in turn, would shift the excess money balances to the sellers of these other assets who may themselves rebalance their own portfolios and so on. The higher asset prices mean lower yields and so lower borrowing costs, which would provide a stimulus to spending. The stimulation would come from a reduction in long-term rates relative to short term rates and the required return of risky assets relative to risk free assets. Spending would also be stimulated by the increase in asset prices meaning that people would be wealthier. All I can say is good luck with that one. The private sector deleveraging is one explanation for why UK Government is finding deficit reduction so difficult. It always amuses me that they focus on the seller side – like the BoE turned up with a gun and forced them to part with their hard won Gilts for some poxy Bank Reserves. Those sellers were already going to sell for whatever reason. So the spending plans were already lined up. Possibly it brought forward the exchange to an earlier point in time. The real question is what the buyers the BoE outbid did instead given that they were looking for very low risk investments. It may be that the next best thing *was* Bank Reserves at 0.5%.